That was my comment to the rest of our bunch, but mostly to myself as we regrouped at the top of the last short climb on the R44 climb, a short ramp which I think of as Yonder Hill but is also referred to as Koosie by some of our riders. We had just completed what must be if not the best, then certainly one of the top 5 circular cycling routes in the Cape, and one that has been on my bucket list for almost as long as I’ve been cycling in South Africa. There are several reasons why it had languished on my list for so long. Firstly, at 130km long and just shy of 2,000m climbing, it is not a route you can do without a level of fitness that I’ve been a long way short of in previous seasons. Second is safety, there are a number of fairly narrow stretches especially from Grabouw through to Theewaterskloof which make it less than ideal to ride alone. But probably the biggest factor is weather. 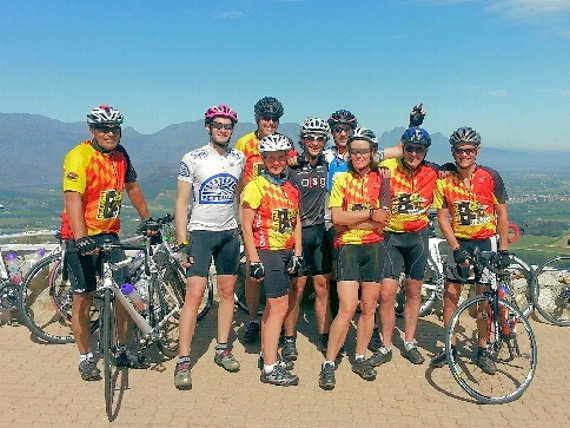 Sir Lowry’s Pass, the first of the four, is a long and not especially hard climb but it snakes up a section of mountainside that is referred to locally as the Wind Factory. What can be a light south easter down in Strand or Somerset West can be howling a gale up through the pass, making it potentially lethal to cyclists who can be all too easily blown into the path of cars and trucks travelling up the pass. To mitigate the safety aspects we called a 5:30am start to our ride, just after dawn and early enough that traffic should be light through the early sections. Even with that though, we’d also said we would only make a definite decision to ride the route if the wind was very light. That was the part I’d had least confidence in, fully expecting us to be slogging off towards Stellenbosch on one of our usual routes. But for once, the weekend weather favoured us with an almost totally wind-still morning – something very rare for Spring in the Cape. So as we rolled out of Watersone car park nothing could suppress the smile on my face or the lightness of my spirits. We were 12 riders, 9 from DC team 4 plus Penny, Des and Dylan from DC team 3 – just the right sized group, and a great mix of personalities to enjoy the route with. I hadn’t really expected much from Sir Lowry’s pass – more a case of getting it out of the way so we could get over to the scenic parts through Grabouw and the Groenland mountains. It’s a fairly big climb but the gradient isn’t especially steep, but what makes it lack appeal is being a double lane busy highway – as a cyclist you don’t feel you belong there, small and vulnerable alongside the noisy trucks, buses and smokey old taxis and bakies labouring past. In the magic of the early morning though it was a serene and peaceful climb. Only a handful of vehicles passed us, and the crisp morning air was still filled with the smell of fynbos, not yet overwhelmed by hot tarmac, rubber and truck fumes. The journey up was a welcome surprise but nothing compared to the breathtaking views from the top, the whole of the Cape Flats and False Bay lay stretched out below bathed in a warm orange glow by the first long, low rays of the morning sun. After a fast free-wheel down the other side of the pass we cycled directly into the sunrise on the short stretch of N2 before our turn off into Grabouw. The town was still mostly sleeping as we sped through, a few souls here and there on the street but the usual bustle of the busy little agricultural town was yet to get under way. At the other end of the town our long downhill from the pass finally came to an end with a sharp little ramp up to the left turn towards Theewaterskloof dam and Villiersdorp. Heading out of town you can almost feel the pace of life slow as the road rolls and winds through an almost ridiculously picturesque patchwork of vineyards and orchards. At some stage a few kilometres beyond Elgin the landscape changes again, and achieves the seemingly impossible feat of becoming more beautiful still. Rolling hills and farmland give way to mountainous crags, fynbos and forestry. Without realising it, we were lucky enough to have brought along our very own tour guide. And as we shifted gears to begin the climb up through our second pass of the day, Ralph regailed us with a stream of interesting facts about the areas we were cycling through, only a few of which I’m embarassd to admit stuck in my memory. One I do remember though is that the pass is in fact called Viljoens Pass, and not Grabouw Pass which I’ve always referred to it as. Another was that the road forms a divide between two different management entities: the forestry to the left coming under MTO (Mountain To Ocean); and the predominantly fynbos clad mountainside to the right coming under the management of Cape Nature. Sweeping around a long bend at the start of the pass, you leave the last of the farms behind and all that you see in front is the glorious mountainsides ahead of you – it hardly seems to matter who is managing them, they are both jawdroppingly beautiful. As with all climbs, the pass fragmented our group, stronger riders relishing a heart pounding race up the climb, and the rest of us, well let’s just say we enjoyed the scenery on the way up. Just short of the summit we paused to regroup by a dam to our left. With hardly a breath of wind to break it’s surface, the water was a serene mirror, reflecting the clump of pines fringing the lake, and open mountain beyond. I was born near the Lake District in the UK, and some of my ancestors from way back come from there also. Some deep part of me seems to be rooted in that heritage, because for the brief moments we stopped in this place, surrounded by the quiet of the mountains, I was home. The summit just a few hundred meters up the road beckoned though, and on we rode. And as we crested the top, the views across the farmlands of Vyeboom and the massive expanse of Theewaterskloof dam were astonishing. We raced down the snaking downhill and dogleg bends to become part of the tapestry below. Our group became so heavily split up by our different descending speeds that we only caught up with Wiehahn some 20km down the road at the Theewaterskloof bridge – Penny describe him as taking the low flying route. At some point on this long stretch to the bridge across the dam Yoli also passed us in our car laden with ice, drinks and snacks for our midway pit stop. It was a very welcome site, but I felt a little guilty she’d be waiting around for us, having slightly miscalculated our average speed. In the end, she had turned back from our planned meet point to find a much more pleasant spot shaded by trees. The detour meant she didn’t have to wait too long until she saw us battling up the road against a suddenly strong northerly wind that had made the last few kilometres much more arduous than the ride so far. That was the first real stretch where we rode as an echelon, taking turns at the front so that no one worked against the wind for too long. It was a delight to see them waiting for us, Ben hopping up and down excited to see dad cycling with his friends, and then suddenly becoming shy and hiding behind Yoli’s legs when everyone drew up close. Cold drinks, ice, snack bars and bananas went down with gusto and after a quick delay getting Theunis’s bike on the rack so he could head home early, we were on our way again all too soon. It was tough to leave them as Ben’s mouth turned into a sad frown and his lip started to quiver. I had fully expected he would want us to stay and play, but that didn’t make it any easier to turn back to face the road ahead and pedal on. The positive part was that ahead lay what must be one of the most scenic tarred passes to ride in the whole of the Western Cape – Franschhoek Pass. A winding gem of a road, lined both sides by quaint stone walls, fynbos, and towering mountains. Even the occasional scream of motorbikes also out to enjoy the road didn’t detract from the sheer beaurty of the 8km climb to the summit. It isn’t actually as steep as the road up on the Franschhoek side, but it’s longer, and the regular blasts of the north wind made it no less difficult. Marc was battling a tad, suffering the combined effects of a half marathon the day before, and stomach cramps from too hastily downing a chocolate milk. I had no desire to rush my first ride up this glorious pass, so was only to happy to drop back a shade and pedal up with him. In the end, we were probably only a few minutes behind the rest of our group, and the relaxed pace allowed plenty of time to savour every moment of the climb. Gathering again at the top, it was great that Styger got a chance to enjoy the view over Franschhoek valley which had been shrowded in cloud and mist on last week’s climb up from the town below. It would have been a shame if he’d ridden to the summit twice in two weeks, and not got to stand and enjoy the vista which must be on thousands of postcards home every year from tourists visiting Franschhoek and its winelands. For the remainder of our ride we rejoined our familiar route home via the final of the four passes, Helshoogte, and then through Stellenbosch and home along the R44. A long held dream fulfilled, and with my extra training this year, a much less challenging ride than I had expected. I even had the legs for one last quick sprint up Yonder Hill at the end, predictably though Penny and Wiehahn both caught and passed me just before the top. One day maybe I’ll have the legs to keep up the pace over those last few meters. For today though, I was content – the four passes ride had not disappointed for one second. A truly awesome ride. All photos taken from Wannabees site.